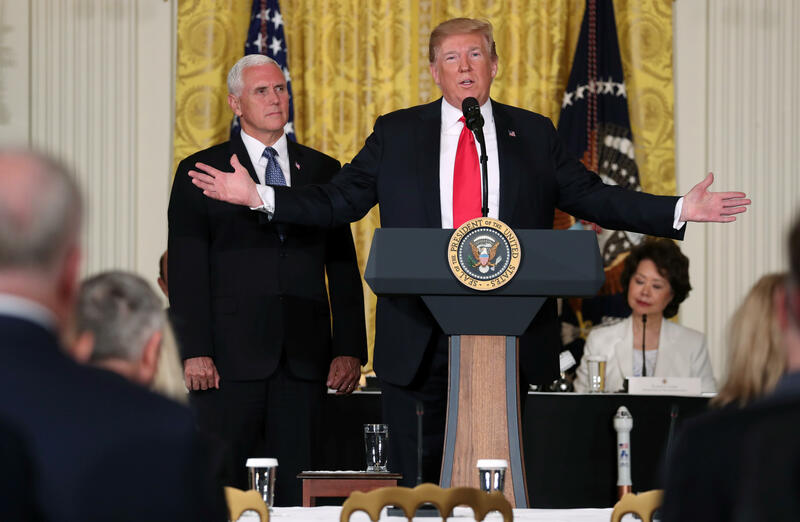 Trump at space event: "The U.S. will not be a migrant camp"
During a meeting with the National Space Council at the White House on Monday, President Trump once again placed blame on Democrats for the country's immigration problems. "Immigration is the fault and all of the problem we are having because we can not get them to sign legislation, we cannot even get them to negotiate to the table. And I say this very strongly: it's the democrats fault," Mr. Trump said at the White House event, calling Congressional Democrats "obstructionists." "The U.S. will not be a migrant camp and it will not be a refugee holding facility, it wont be," he added. Mr. Trump said that if Democrats would "sit down instead of obstructing, we could have something done very quickly" with regards to immigration legislation. "If they come to the table instead of playing politics we can do it very quickly," he said. Briefly referring to the administration's controversial child separation policy, Mr. Trump said, "We're stuck with these horrible laws. What's happening is so sad. And it can be taken care of quickly beautifully and we'll have safety." He added that no country in the world has such "sad, bad and in many case so horrible and tough" immigration laws. Meanwhile, at Monday's event, Mr. Trump directed the Department of Defense and Pentagon to "immediately begin the process necessary to establish a space force as the 6th branch of the armed forces." Mr. Trump has repeatedly claimed that he would act on such a promise, calling American dominance in space a "national security" issue. Last month, Vice President Pence said Mr. Trump was hosting the meeting of the council "as a sign of the administration's commitment to the U.S. leading in space again." The newly re-activated council is working to streamline regulatory requirements that frequently slow development of new commercial space initiatives, keeping with the Trump administration's directive to encourage more private sector development on the high frontier. Mr. Trump also signed a directive establishing principles for Space Traffic Management – to avoid satellite collisions and address challenge of increasing congestion in Earth orbit. The policy will provide guidelines and direction to "ensure that the United States is a leader in providing a safe and secure environment as commercial and civil space traffic increases," according to the White House.